The St. Louis Strutters have been performing fast tapping precision dance routines with a rich history of skill and dedication to their talent for thirty years. Fashioned from the early 1900’s – to Jazz – to Broadway this high-kicking chorus line perform rhythm tap dances with style and glamour. 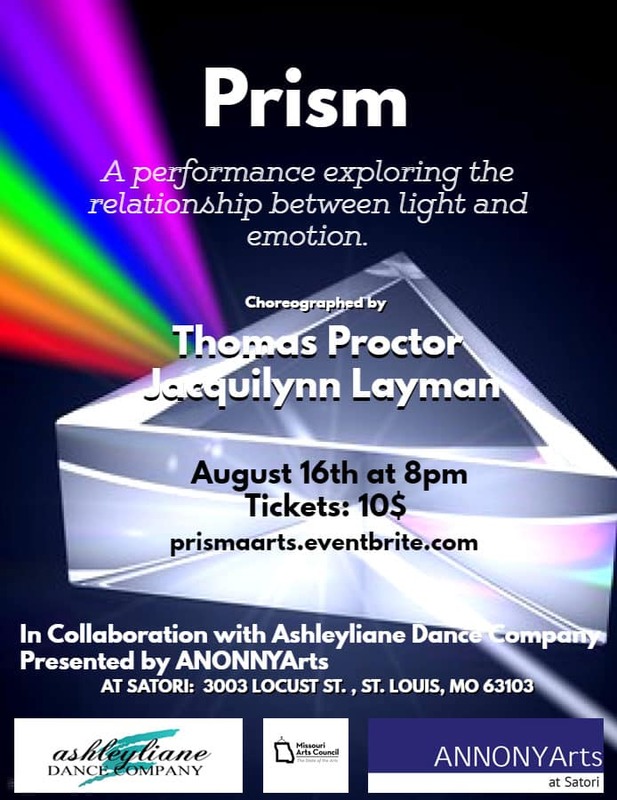 Making St. Louis a great place to artfully age! Hi Everybody. I’m proud to share with you this extraordinary great news and a MAJOR COUP for us. We are proud to present Norma & group as a bonus program for our fall season. Come join in the fun. In the brand new Lee Auditorium at the Missouri History Museum. You will be so very 😊 that you were part of one of the very first groups to be here. WE ARE EXCITED TO OFFER YOU A DOUBLE HEADER THIS MONTH. Its time to Fall in Love with the Silver Stages on Wednesday, October 3 and then plan to attend our upbeat and always fabulous energetic tap dancers… Norma’s Syncopated Seniors on Wednesday, October 10. We promise you and your friends will ♥♥ love ♥ them both! Our 1st theatrical. Enjoy the Broadway sensation: A.R. Gurney’s Love Letters, the story of a 50-year correspondence between Melissa Gardner & her childhood-friend-turned-love-interest, Andrew Makepeace Ladd III. The Silver Screen Series begins tomorrow at 1pm. I’m attaching all the info about the who, what, where, when, and, of course….you are aware of the why…to enjoy an afternoon at the movies, have fun, and if interested, stay for a meaningful discussion. Hope to see you and your friends tomorrow at the movies…AMC Creve Coeur 12. Thanks for your interest and support of what we do! Maturity and Its Muse, and the City of Creve Coeur Arts Committee, is proud to announce the guest discussion leaders for the sixth annual Silver Screen Series. 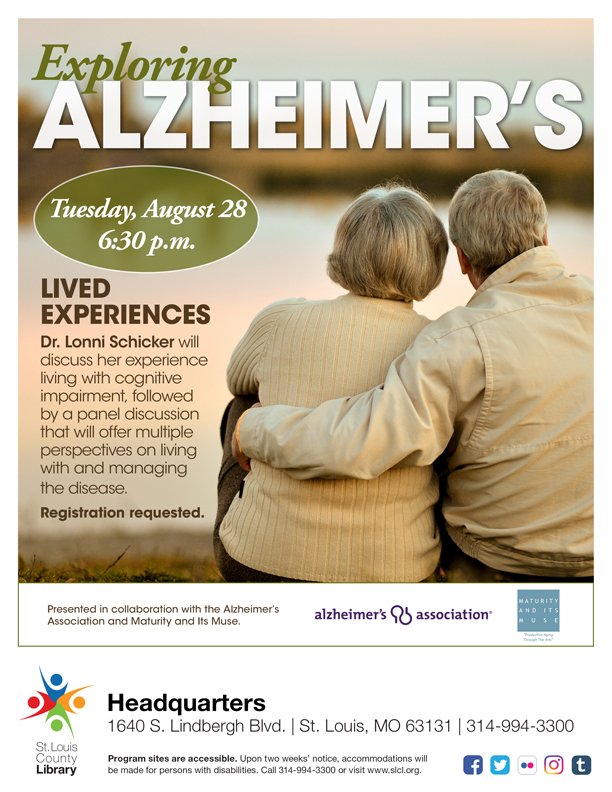 The free film series focuses on films that explore positive aging themes, and each film concludes with an optional discussion between attendees and guest discussion leaders. SEPTEMBER 17: Film: Still Alice When words begin to escape her and she starts becoming lost on her daily jogs, renowned linguistic professor Dr. Alice Howland must come face-to-face with a devastating diagnosis: early-onset Alzheimer’s disease. Discussion leader: Alzheimer’s Association The discussion leader will offer her personal experiences as a care giver and volunteer from the Alzheimer’s Association, St. Louis. The Alzheimer’s Association provides education and support to all those facing Alzheimer’s and other dementias throughout the community, including those living with the disease, caregivers, health care professionals and families. OCTOBER 15: Film: Nebraska When cantankerous old buzzard Woody Grant (Bruce Dern) receives a sweepstakes notice in the mail and insists on making a 750-mile trip to Lincoln, Neb., to collect his prize, it falls to baffled son David (Will Forte) to accompany him. Discussion leader: Jan McGillick, MA, SW, LNHA – Director of Community Engagement at Dolan Memory Care Homes Jan McGillick has had a lifelong passion advocating for older adults. She received her Master’s Degree in social work from the University of Chicago and later served as Education Director and Director of the Alzheimer’s Association Education Institute. McGillick now works at the Dolan Memory Care Homes, building programs that meet the psychosocial needs of the Dolan residents through aging in place and end of life care. NOVEMBER 19: Film: The Curious Case of Benjamin Button Benjamin Button (Brad Pitt) springs into being as an elderly man in a New Orleans nursing home and ages in reverse. Twelve years after his birth, he meets Daisy, a child who flickers in and out of his life as she grows up to be a dancer (Cate Blanchett). Discussion leader: Gary F. Bell, Artistic Director of Stray Dog Theatre Gary F. Bell has done it all, from acting to directing to teaching, and is currently the Artistic Director and founder of the Stray Dog Theatre in St. Louis. Before moving to St. Louis in 2000, Bell attended the American Academy of Dramatic Arts and joined the American Ensemble Studio Theatre. He is also a celebrated playwright, recognized by the Eugene O’Neill Playwrights Conference for his play, Justice for Justine. In previous years, the film screenings were held every Monday in September. Starting this year, the Silver Screen Series will instead be presented on the third Monday of each month — September 17, October 15, and November 19. All film screenings will be held at AMC Creve Coeur 12, 10465 Olive Blvd., from 1:00 – 4:00 p.m. Doors open at 12:30 p.m. Thanks to the generosity of AMC Creve Coeur 12 and the City of Creve Coeur, the Silver Screen Series is offered free of charge to the public. These events would not be possible without the support of our community partners: Oasis, Cinema St. Louis, The Harvey A. Friedman Center for Aging at Washington University, and VOYCE. For more information on the series, please contact Lynn Hamilton at lynn@maturityanditsmuse.org or (314) 420-1444 or Melissa Orscheln at morscheln@crevecoeurmo.gov or (314) 442-2081. Thank you to the Institute of Public Health at Washington University for inviting me to contribute my thoughts on the quality of life enhancements that the arts’ engender to their May 2018 blog. I am happy to share these thoughts here. Thanks for reading, sharing, and participating in your favorite art form and/or enjoying a new one. The 2018 theme for Older Americans Month, Engage at Every Age, emphasizes that you are never too old (or young) to take part in activities that can enrich your physical, mental, and emotional well-being. I engage in my community by sharing my passion for art — and its benefits — with others. Research has illustrated that participation in activities that encourage creative engagement in a social environment have positive physical and psychological benefits for people of all ages. For example, a RAND report, Gifts of the Muse: Reframing the Debate About the Benefits of the Arts, highlights findings about the instrumental benefits of the arts including improved physical and mental health for older adults and increased social interaction among community members. In addition the RAND review supported the intrinsic benefits of the arts including expanded capacity for empathy and cognitive growth. Singing, dancing, or playing the banjo are all activities that can bring pleasure, improve wellbeing, and help create social bonds. As an entrepreneur, former gallery-owner, and a lifelong supporter of arts programming in St. Louis, my experience in the art world has provided an opportunity to champion older artists and organize events for people to explore art and opportunities for creative engagement. In 2009, I founded Maturity and Its Muse, a community driven non-profit dedicated to improving the minds, health, wellness, and quality of life for older adults in the St. Louis region. Engaging participants in different modes of art — from watching and discussing a film to participatory art — is the main goal of Maturity and Its Muse. Maturity and Its Muse was founded with its eponymous exhibit in 2010 at the St. Louis’ Sheldon Arts Gallery. Since this show, we have held two subsequent iterations, including the current, “Maturity and Its Muse: Celebrating Artistic Experience” now on view at Art Saint Louis until May 24. This juried exhibit features the work of 32 regional artists over the age of 70. Other ongoing programs that we have established include the Kemper Art Reaches Everyone (KARE) program, developed in collaboration with the Mildred Lane Kemper Art Museum and faculty at Washington University in St. Louis. KARE is designed for adults with early to moderate Alzheimer’s and other dementias. In this one-hour, multisensory program, participants engage with four or five pieces of art in the museum’s galleries. The KARE program is free and available to memory care groups upon request to either the museum or by contacting me. In September 2018, my organization, along with community partners, will present the Sixth Annual Silver Screen Series: Films Celebrating Creative Aging Through the Arts. Our Silver Stages Series: Mature St. Louis Performers for Mature St. Louis Audiences, a partnership with the Missouri History Museum, will also begin its sixth season of performances. Among our programs with ongoing partnerships are events with the St. Louis County Library and our Memories@MoBot monthly program developed with the Missouri Botanical Garden. Our latest endeavor, Celebrating Art for Senior Engagement, a community-wide festival with 50 partner organizations presenting 82 programs, completed its third year in April 2018. In addition to my work connecting people to opportunities for engagement, I specialize in connecting organizations to other organizations where there can be a synergy in creative service that will benefit older adults. I also aim to highlight how the lives and experiences of mature, seasoned artists can serve as positive, productive examples of aging for all of us. One such artist is Barbara Holtz (age 94), whose two artworks are featured in the current exhibit at Art Saint Louis. 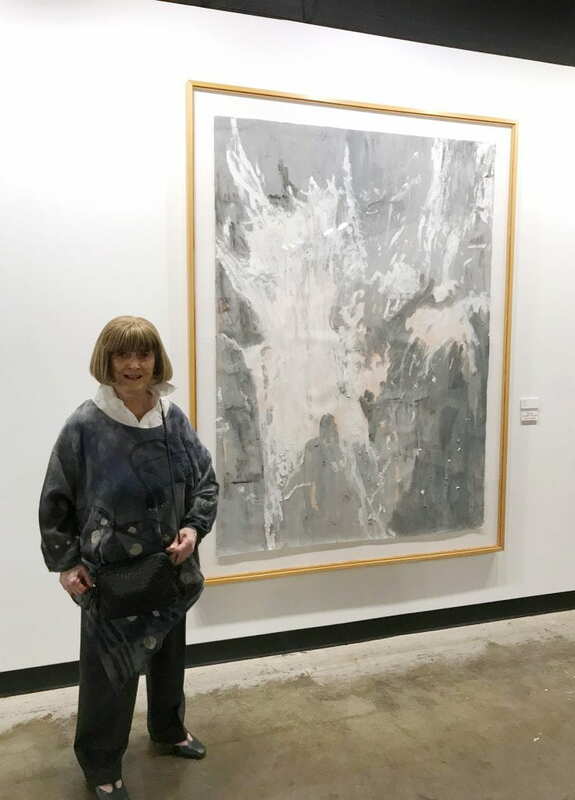 Barbara Holtz, featured artist at “Maturity and Its Muse: Celebrating Artistic Experience,” Art Saint Louis, April 21, 2018. Photo Credit: Robin Hirsch-Steinhoff. I am continually envisioning new opportunities for creative engagement and organizations with which to collaborate. Learn more about Maturity and Its Muse on my website and do not hesitate to reach out to me if you would like to discuss an opportunity for partnership or to connect to current programs. Our programs and events are free and open to the public.